Got any plans? 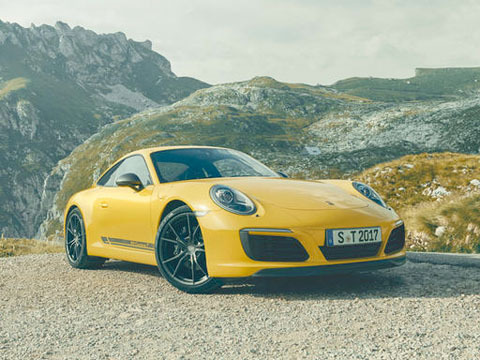 This sports car will take you to a place you haven't been for a long time. Closer to the road, and closer to yourself. Come on, get in. Not some other time; right now. Go on a road trip that begins with the turning of the key and preferably never ends. Driving for the sake of driving. A concept already represented by the 911 T back in 1968, fully epitomized by the T for Touring in the model logo. The declared objective at the time: to conquer the road. With a base engine producing 110 hp, and a specification stripped down to the essentials. 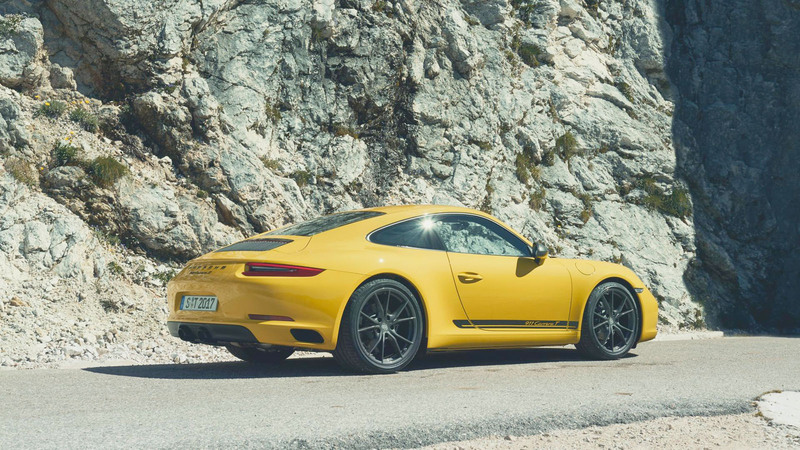 For maximum driving pleasure and a unique driving feel experienced in a 911 – intimate and unmistakable. 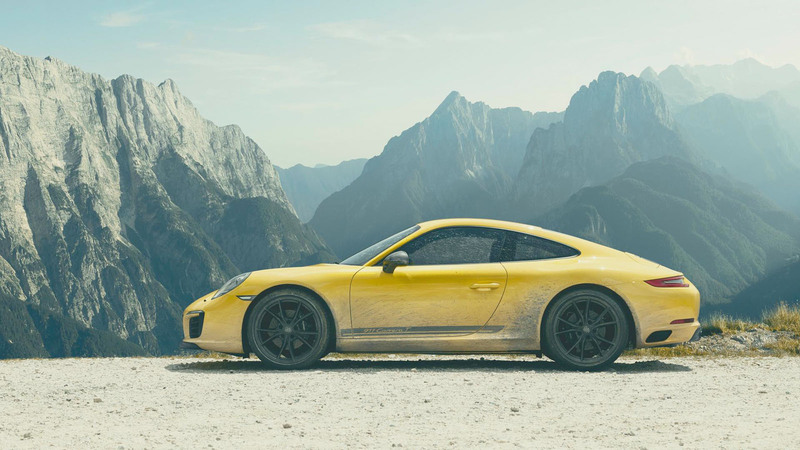 The new 911 Carrera T might have evolved greatly from the original model, but the concept hasn't changed: less is more. Less weight and, above all, more driving pleasure. What do we mean exactly? Interior soundproofing has been reduced to the bare minimum. The rear window and rear side windows are made of lightweight glass. Rear seats can be omitted with selection of the Full Bucket Seats. The rearmounted six-cylinder horizontally opposed engine soundtrack plays clearly through the standard sport exhaust system. Performance is controllable through the mode switch mounted to the steering wheel in interaction with the PASM Sport suspension and Porsche Torque Vectoring (PTV) with a limited-slip differential. 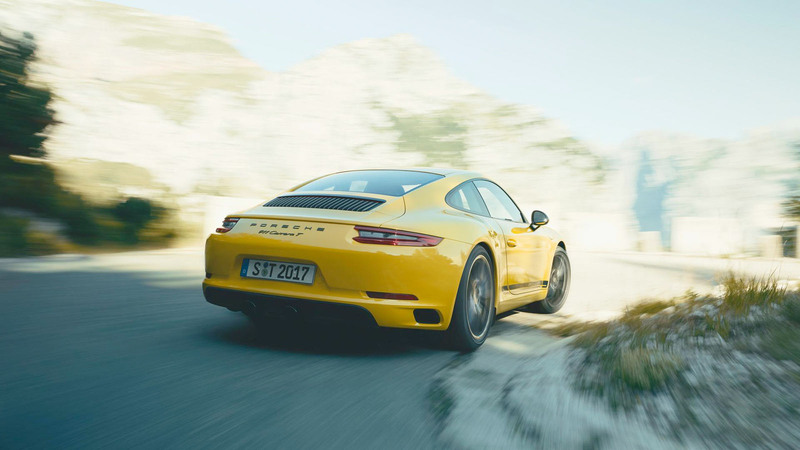 These measures combine to make the new 911 Carrera T an unadulterated sports car – one that fully lives up to its Sixties predecessor. You might find it difficult, but it's something we recommend: pull over, get out, and stop for a while. 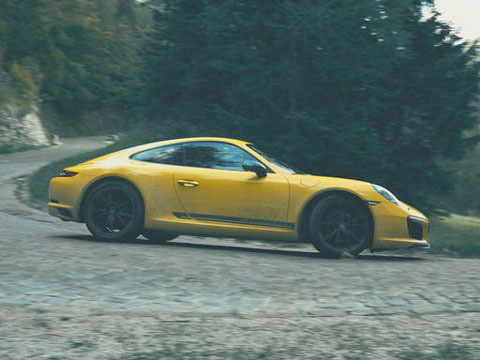 Feast your eyes on the new 911 Carrera T.
It's a promise. A temptation. A challenge. A means of escape from everyday life. 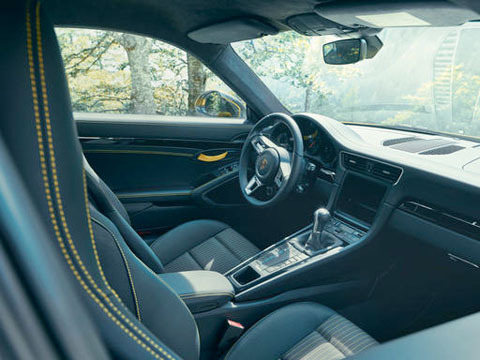 The 911 Carrera T has everything you want from a 911. A timeless silhouette, prominent front fenders, a swooping roof line, and an imposing rear end. 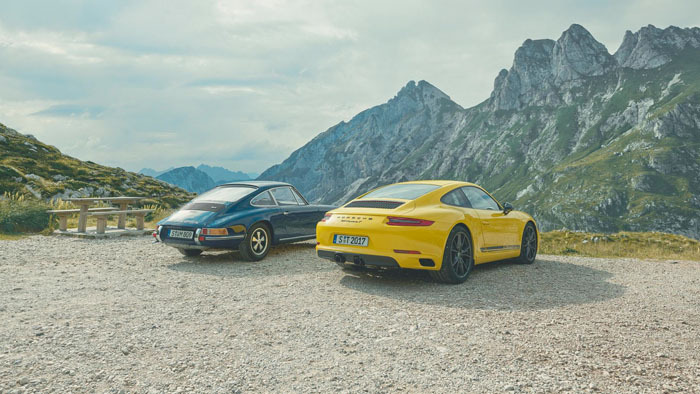 Sports car proportions – as only defined by the 911. Turn your gaze forward to the front end of the 911 Carrera T with its clear form, large air intakes, and aerodynamically adapted front spoiler lip. Details on the sides of this sports car will further catch your eye: decorative stripes with the '911 Carrera T' logo and SportDesign exterior mirrors painted in Agate Grey. 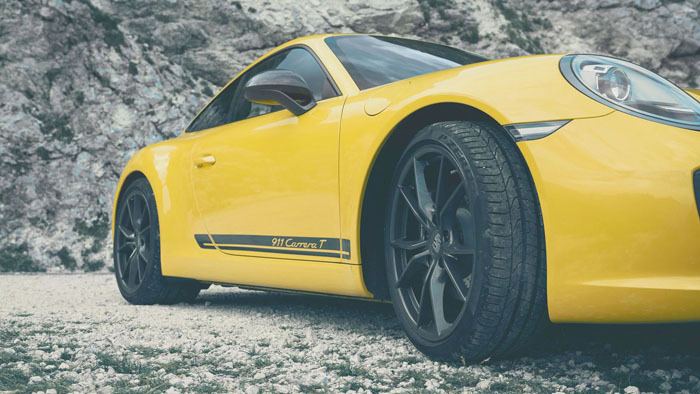 20-inch Carrera S wheels provide the grip necessary for excellent roadholding – exclusively for the 911 Carrera T, they are painted in high-gloss Titanium Grey. 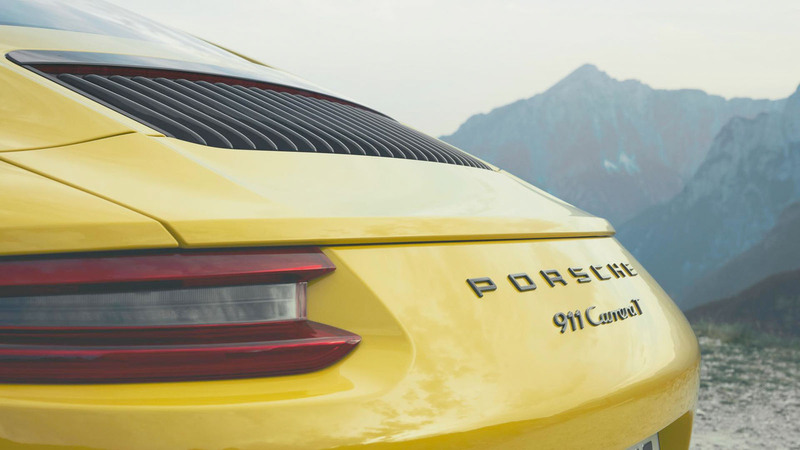 Turn your gaze to the rear where you will find further accents in Agate Grey: in addition to the '911 Carrera T' model designation, the rear lid intake grille slats are also finished in this contrasting color. Underneath, the sport exhaust system features centrally positioned tailpipes in black. Raw, authentic, and unconcealed. Seldom has the unfiltered truth looked so good. But we suspect you're burning to get back behind the wheel. Do you feel at home? That's exactly our intention. 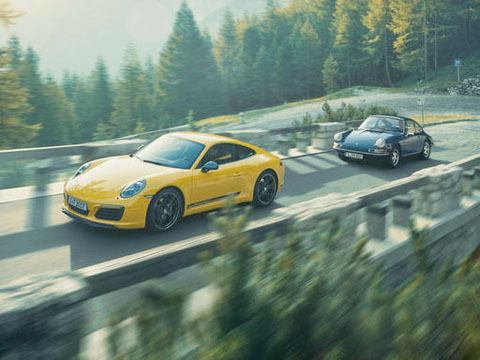 Every component, every switch, and every bit of material in a 911 is tailor-made for sporty driving. And for you. Your hands grip the GT Sport steering wheel. In direct reach is the mode switch, offering the driving modes Normal, SPORT, SPORT PLUS, and Individual - which you can configure to define a driving style of your own. The interior: black and pure. Surfaces within grasp are covered in smooth-finish leather. In contrast, the trim strips are painted in high-gloss black. The door closes with a solid, satisfying sound. Your left hand reaches for the ignition key, your right for the shortened gear lever – designed for even more direct shift throws. The Guards Red shift pattern reinforces the sporty allure. 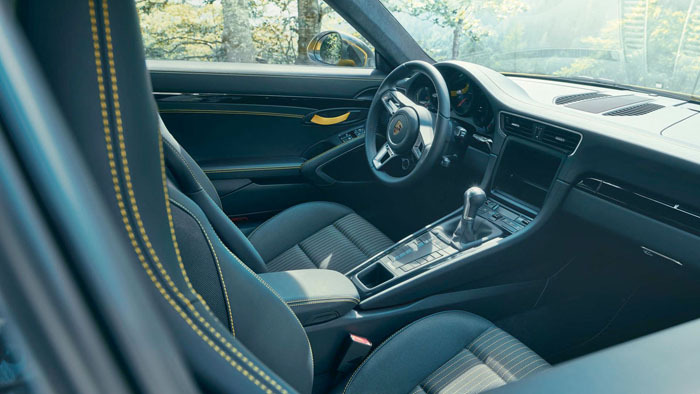 The new 911 Carrera T accelerates from 0 to 60 mph in 4.3 seconds, pushing you back into the Sport Seats Plus fitted as standard. 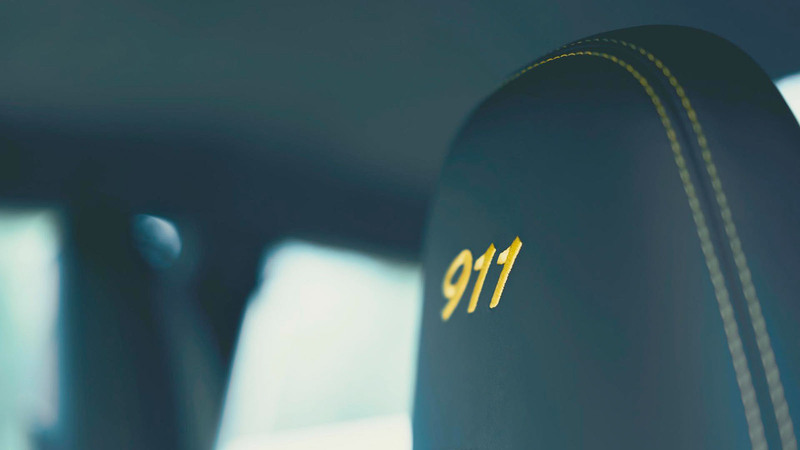 The '911' logo is embroidered on the headrests in black. 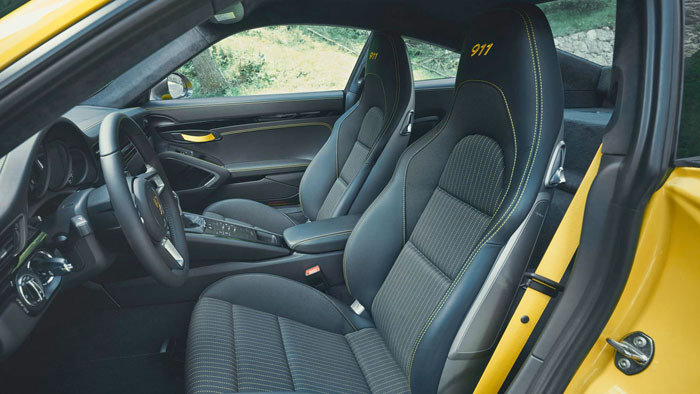 The optional Carrera T interior package adds interior accents in the contrasting colors of Racing Yellow, Guards Red, or GT Silver. 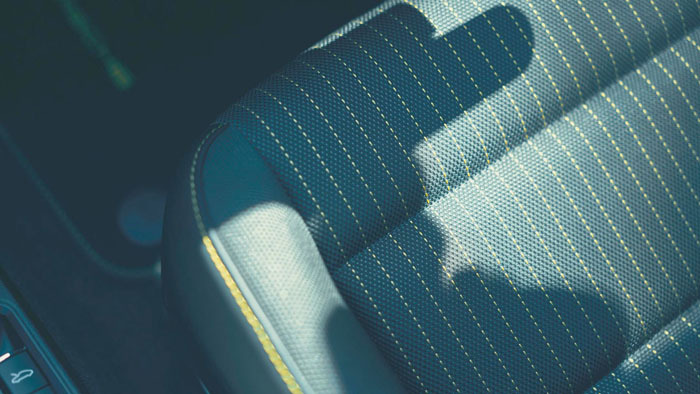 The package highlights the Sport-Tex cloth seat centers with deviated stitching in the contrasting color. Full Bucket Seats made of carbon fiber reinforced plastic (CFRP) are optionally available for the first time in a 911 Carrera and feature Alcantara® seat centers. 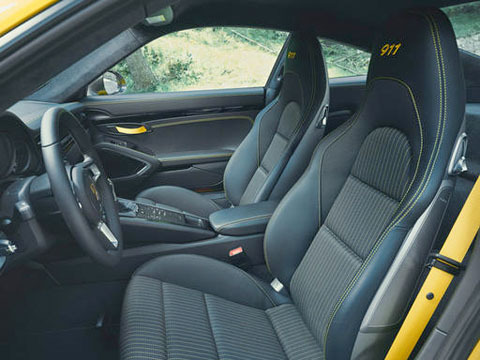 When chosen, the rear seats are removed, also a first for the 911 Carrera . Nevertheless, your attention should now be focused on what's next to come: mighty performance. 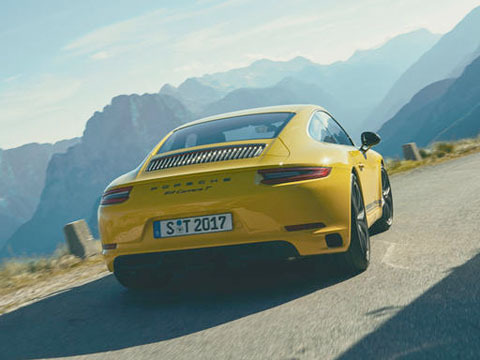 Positioned down low in the rear of the 911 Carrera T is the six-cylinder twin-turbo engine. The 3.0-liter power plant is rated at 370 hp and develops a maximum 331 lb-ft of torque. These are hard figures to precisely summarize the engine's performance, but they don't even come close to describing its effect. More meaningful are the resulting acceleration figures: the sprint to 60 mph is completed in just 4.3 seconds. Top track speed is 182 mph. There's nothing really left to say. Well, almost nothing. There are still the impressive qualities of the twinturbo engine: immediate responsiveness and a wide torque plateau reached relatively low in the rpm band. Let's not forget the mighty sound of the twin-turbo flat-six engine further reinforced by the sport exhaust system, fitted as standard, with two centrally positioned high gloss black tailpipes. In short: high performance delivered immediately to the road and the driver. Which brings us back to you. A basic lesson in driving pleasure: depress the clutch pedal, shift gears, accelerate, smile contentedly – and repeat. When changing gears, everything is in your hands. Driving pleasure included. 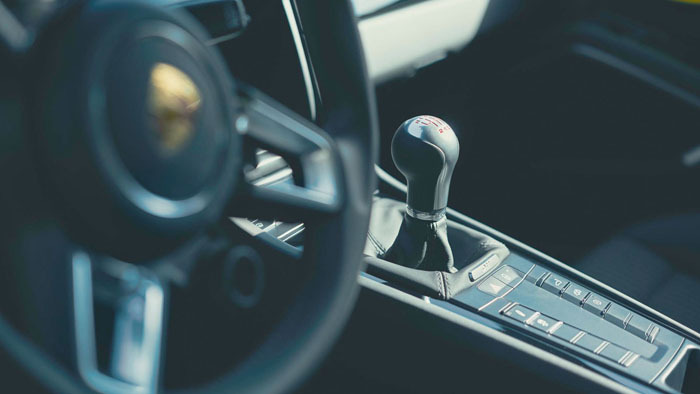 The 7-speed manual transmission represents sportiness in pure form, with short shift throws and an optimum transition from one gear to the next. This leads to swift gear changes and an intimate relationship between the driver and the car. The dynamic rev-match function active in SPORT or SPORT PLUS mode ensures the optimum engine speed during downshifts for an even more emotional driving experience and sensational sound. The gear lever has been shortened and the shift pattern in Guards Red shows how it's done. 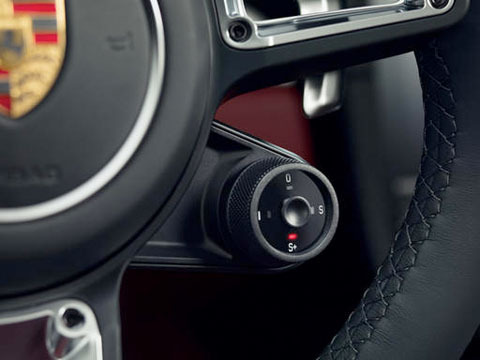 For extremely fast gear changes with no interruption in the flow of power, the 7-speed Porsche Doppelkupplung (PDK) transmission, featuring both a manual and an automatic mode, is available as an option. No obligations and a world of opportunities. Hands firmly on the wheel, the road in view. The body sits a further 10 mm lower than that of the standard 911 Carrera . 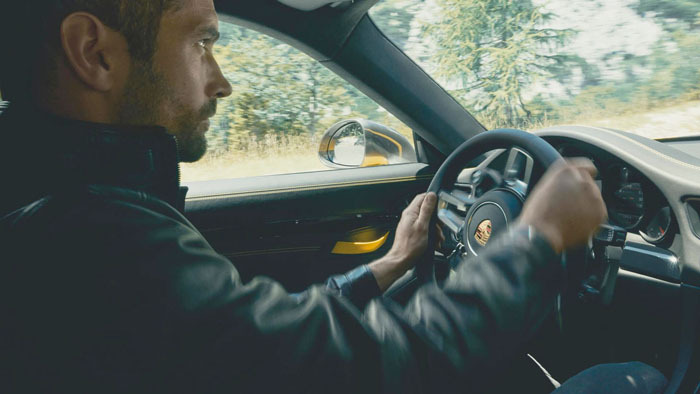 Porsche Active Suspension Management (PASM) – the electronic damping control system – continuously adjusts the damping force on each wheel based on current road conditions and driving inputs. The springs are firmer and shorter, and the anti-roll bars on the front and rear axles are stiffer. The front spoiler lip has an even sportier contour and the rear spoiler extends further. The result is reduced lift at the front axle and increased downforce at the rear axle for improved aerodynamics and another boost in performance. 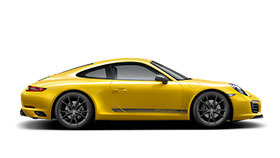 Fitted as standard, Porsche Torque Vectoring (PTV) enhances vehicle dynamics and stability. Operating in conjunction with a limited slip rear differential, the system works by intelligently braking the rear wheels as the situation demands. When the car is driven assertively into a corner, moderate brake pressure is applied to the inside rear wheel. Consequently, a greater amount of drive force is distributed to the outside rear wheel, inducing an additional rotational pulse (yaw moment) around the vehicle's vertical axis. The result is experienced through direct and sporty steering action from the turn-in point. The mechanically regulated rear differential lock included with PTV has an asymmetrical lock factor. This helps to provide greater traction when braking into and accelerating out of corners, and when driving on road surfaces with varying grip. The results are strong resistance to destabilizing side forces, outstanding traction and great agility – with precise turn-in and well-balanced load transfer characteristics. And, of course, tremendous fun in the corners. Rear axle steering is available as an option. It enhances performance and everyday practicality in equal measure, for particularly agile handling combined with a significant increase in driving stability. During low-speed maneuvers, the system steers counter to the front axle to provide a virtual shortening of the wheelbase. Thus, cornering turnin becomes considerably more dynamic. At higher speeds, the system steers in the same direction as the front axle, causing a virtual extension of the wheelbase to increase driving stability. All of this has positive impact on maximum driving performance. Left corner. Right corner. Then the long straight. 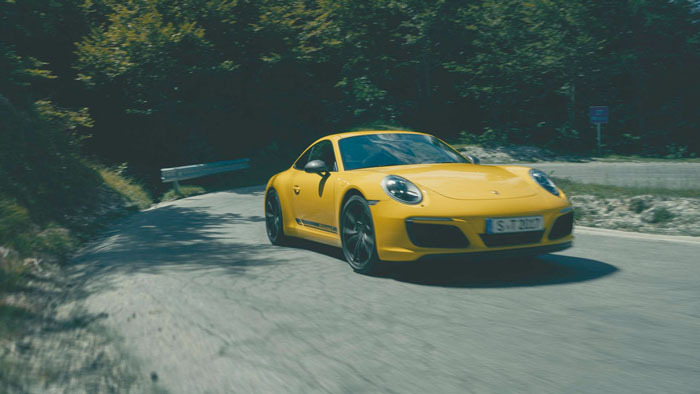 An invitation you can really only accept with a sports car, and with the new 911 Carrera T above all. 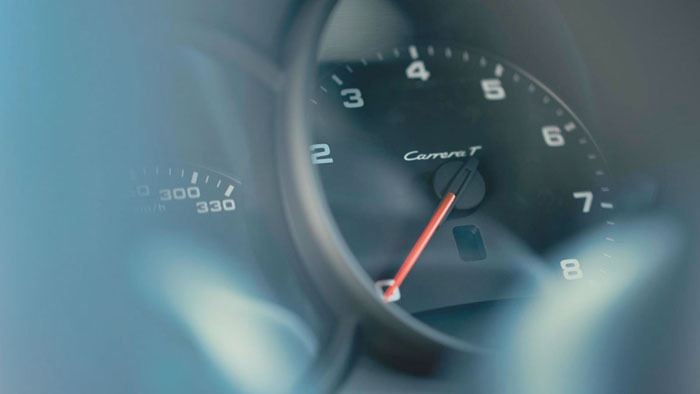 In SPORT mode, the electronic engine management system demands a sharper response. Engine dynamics become more direct and the sport exhaust system is activated. 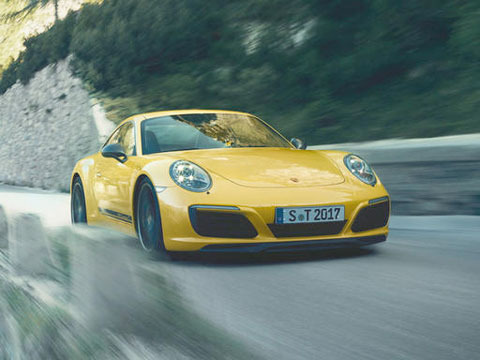 In SPORT PLUS mode, the new 911 Carrera T can unleash its full potential. Engine, chassis, sport exhaust system – everything is geared 100 % for performance. The result: an even mightier sound, even sportier damping and even better driving dynamics. The PCM is your main control center for audio, navigation and communication. For when you don't want the raw sound of the sport exhaust system to be the soundtrack to your journey: the vehicle is equipped as standard with the Sound Package Plus featuring eight loudspeakers and 150-watt total output via the integrated amplifier with digital signal processing. 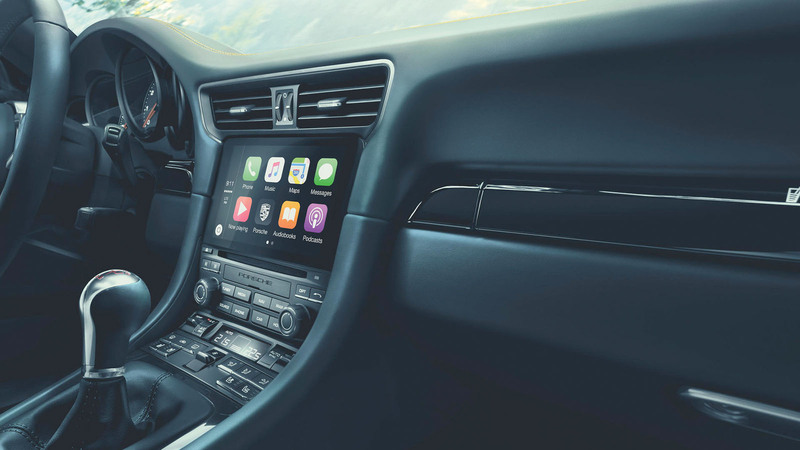 Optionally available, the BOSE® Surround Sound System has been specially developed for the 911 models and offers a total output of 555 watts. It has 12 fully active loudspeakers and amplifier channels, including a robust, patented 100-watt high-power subwoofer. The Burmester ® High-End Surround Sound System offers sound performance of the highest level. In numbers: 12 amplifier channels with a total output of 821 watts, 12 loudspeakers including an active subwoofer with 300-watt class D amplifier, a total diaphragm surface area of more than 1,340 cm2, and a frequency response of 35 Hz to 20 kHz.